How do I configure SQL-RD to use my email server? On this page, we will discuss the various email options available to you when using SQL-RD and how to set them up. When you click on the Messaging tab in SQL-RD's Options window, you will see that you have two separate messaging options (shown on the tabs): Email Settings and SMS Settings. On this page, we will discuss the various email options available to you when using SQL-RD and how to set them up. No separate server is required in order for SQL-RD to send e-mail. However, if you are unfamiliar with your organization's e-mail settings, you may want to have a system administrator set these for you. The MAPI Profile is how SQL-RD will communicate with your email system, global address book, and other email functions. Depending on the version of Windows you are running, it may also communicate with your security rights and the service packs you have installed. The drop-down may not show the list of profiles which exist on your PC. In the MAPI Section, click on the More... 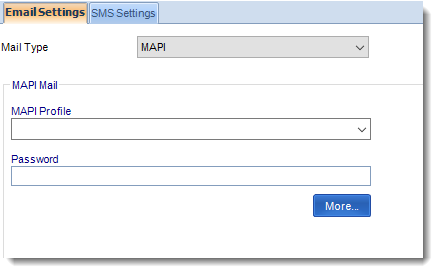 The More button allows you to specify additional settings for the MAPI messaging. You can choose to set SQL-RD to use the Exchange Server, to email reports using Exchange or Office 365, or to use Stand-Alone Outlook. Check the box next to Use currently logged in user to send emails during manual execution if you would like SQL-RD to use the currently logged in Windows account (rather than the MAPI profile you are currently inputting) for emails that are sent when a schedule is manually executed. 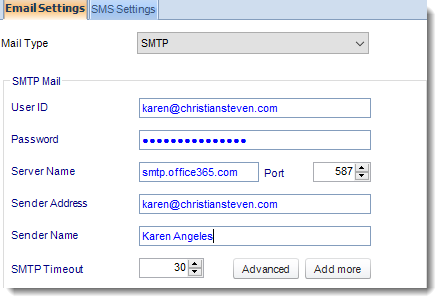 If you want SQL-RD to interface directly with your Outlook profile, select Stand-Alone Outlook from the drop-down menu. Using this option, SQL-RD will not send emails if you are not logged into the server with Outlook open. This is the case even if you are running SQL-RD as an NT service. SMTP Timeout: Use this to determine how long SQL-RD will wait for a connection from your SMTP server before declaring a failure. The default is 30 seconds, but you may need to adjust this depending on your preference. If you would like SQL-RD to notify you when an invalid email address is entered, check the box next to Throw an error if an invalid email is detected. This does not affect other aspects of SQL-RD. You will still be able to use SQL-RD to print, export to folder, or export to an FTP destination, etc. If you would like SQL-RD to keep trying to send emails after they've failed to send once, click the checkbox next to Try re-sending failed emails. If you would like SQL-RD to Automatically embed related images into HTML emails, verify the checkbox next to this option is checked. By default, SQL-RD will automatically embed an image if the link is placed in the body of an HTML email. Keep this box checked if you wish for this to occur. 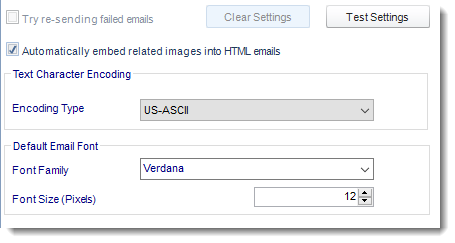 If you would rather the image link be placed in the HTML email body (rather than the image itself), then uncheck this box. 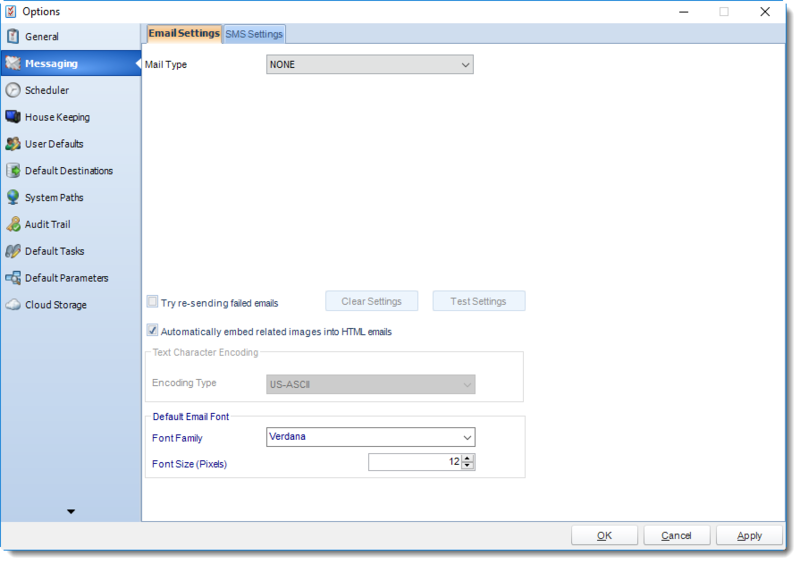 If you would like to set or change the Default Email Font use this option to set the font family and font size.